Digital Comics to Hit Amazon! Netflix is not alone when it comes to seeking out new strategies to deliver more content under its brand. Amazon is trying to expand, too. 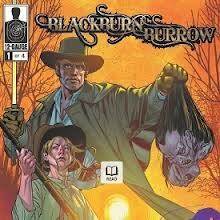 Amazon Studios recently announced that it will be releasing it’s very first self-commissioned digital comic, an adaptation of the Blackburn Burrow Civil War story. In fact, you can get your copy for free right now at the Amazon Kindle store. The story was originally a screenplay written by Jay levy, and the comic is written by Ron Marz (known for scribing the content for popular titles such as Green Lantern) and illustrated by Matthew Dow Smith (praised for his drawings in Doctor Who, and X-Men Icons). You can read more about what to expect in the comic here. This new direction for Amazon is actually a result of customer feedback, which the company is known heavily to rely upon to strengthen its business. Likewise, the new project is a strategy for Amazon to obtain more reviews and feedback from its consumers in an effort to decide whether to take the project to an even higher level: developing the screenplay into a full motion picture. The move comes at a poignant time for Amazon, as it has recently launched an entire slew of new tablets and e-readers including the Kindle Paperwhite and the Kindle Fire HD. Additionally, the digital comic scene is buzzing, chiefly due to the huge increase in use of tablets. The Blackburn Burrow digital comic is expected to be released in increments over the next several months from 12 Gauge Comics, the company that is also working alongside Ron Marz in order to polish up the story and ready it for the comic world.